We are SO proud to announce that we have been asked to be a sponsor at an upcoming super swanky event called Oxfords and Oysters! 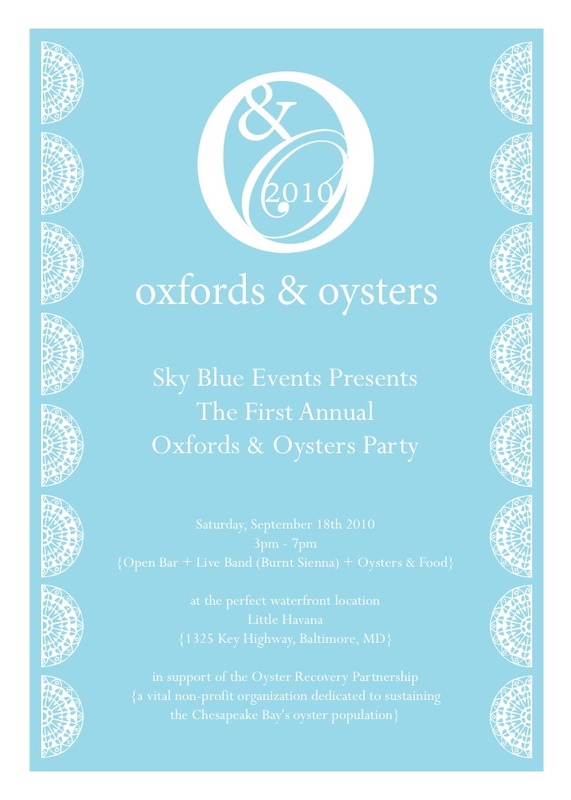 Oxfords and Oysters is a first annual event benefiting the Oyster Recovery Partnership. The event will be held in Baltimore, Maryland September 18th and looks like LOADS of fun!!! Click here to get your tickets! We feel so honored that they picked us and are looking forward to attending and meeting the entire Sky Blue Events team! Check out the other sponsors! WOO HOO! Of course they are giving away an INCREDIBLE swag bag (as any good event does), and we are thrilled to be donating an item ourselves! And without further adieu, we introduce to you an oh so swanky and preppy, exclusive item! Now if we could just find that perfect dress!!! Of course...more pictures to come! So we mentioned a few weeks ago that we were busy finishing up a Candy Land Birthday party. Well, the time has come!!! WHAT A PARTY!! Enjoy these incredible photos...definite eye candy! SO Swanky and is she not PRECIOUS?!? I don't know about y'all but this party makes me want cotton candy and funnel cakes! HA! What a fun and creative shin dig! 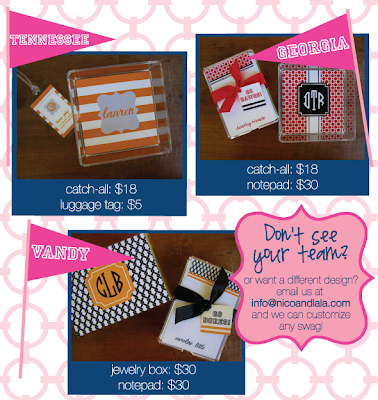 Preppy 101's Luggage Tag Giveaway!!! We have a luggage tag up for giveaway!!! WOO HOO! Preppy 101 has been so wonderful to us and is featuring us on her blog for a FAB set of luggage tags! 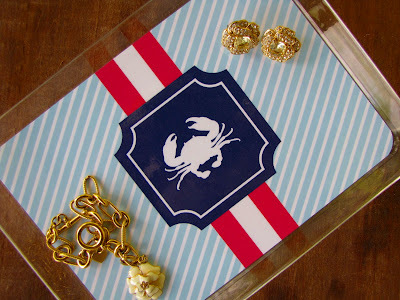 Click here to view her oh so preppy blog and get your very own! We can completely customize yours in whatever colors you like! Just a few of the luggage tags we have printed today...bridesmaid gift tags (GREAT idea) and a luggage tag with catch all = the absolute perfect hostess gift!! We just love creating every detail of an invitation...so why not seal that beautiful envelope with a custom stamp! So neat and what an impression this makes when they see THAT in their mailbox!?!? Lordy, Lordy we love these! 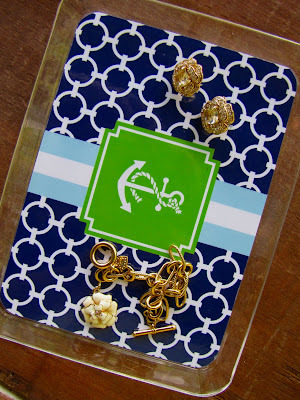 Drum Roll Please....A New Lucite Item!!!! We seem to have gone a but lucite crazy over here at Nico and Lala, but can you honestly blame us?!?! Introducing, the customized desktop pen holder!!! Pens, pencils, makeup brushes, you name it! I use mine for my makeup brushes with my matching catch all on my vanity! And it's only $12! You cannot beat a $30 completely custom gift! $18 catch all and $12 pen holder, and voila! Enjoy! Annnnddd we don't know about you, but who else is ready for football season and long sleeves??? Add Some Prep To Your Pride! These make such great gifts! And of course all items can be customized for us older folks who are past our "college prime"! ha! We are definitely making notepads for ourselves with a preppy pattern to match our office! YAY!!! Do you need a fun little happy for someone?! 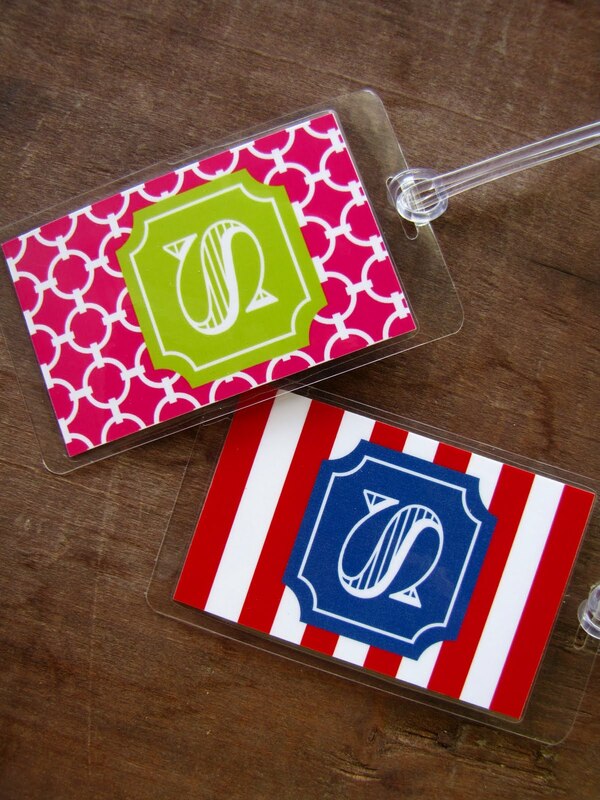 Custom luggage tags are such a great gift! Practical and super swanky!! We create everything custom so you tell us the look and feel you want and we will send you some swanky designs to choose from! And they are only $5 each!!! Also, these paired with a lucite catch all or a set of notecards or calling cards (see below), make a wonderful hostess gift! You can even coordinate all 3! 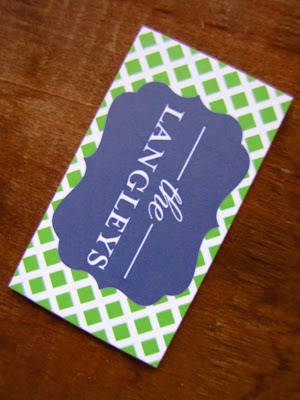 Calling cards are $20 for 25, and $40 for 50! 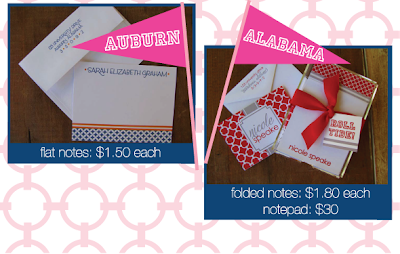 Calling cards and stationery is also the perfect wedding gift! Any girl loves to see her new name in print! Nothing in this world finishes an envelope quite like a liner. Look how chic and sophisticated this is. The contrast of the yellow against the navy is just stunning! We can do any envelope lined, from personal stationery to wedding! We create the custom design, print, and hand line! And we just HAD to show the custom coordinating chocolate bar! DIVINE!!! We have found ourselves doing a lot of small business branding and marketing materials, which of course we LOVE doing!!! Just thought we would share a few things we have done recently! 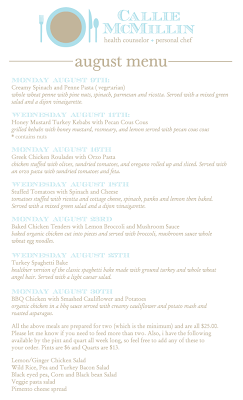 Callie McMillin is a friend of ours and does small events catering and also home meal deliveries. The best part?! It is all DELICIOUS and HEALTHY!!!! We 100% recommend her--she is precious and her food is FAB. She is the perfect person to use if you are in Nashville and throwing a shower or luncheon and do not want to deal with making food! She takes care of it all! 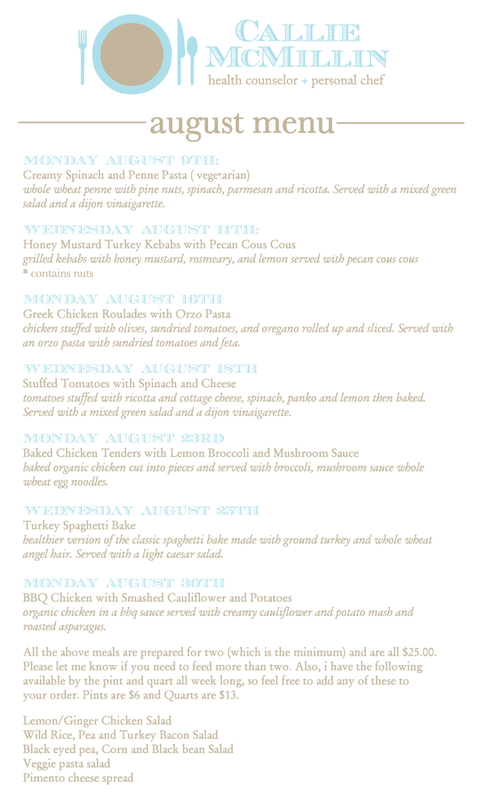 Does this menu not make your mouth water?! These are magnets we had made, that we thought she could toss into bags when she makes a delivery! Such a great marketing tool and shows off the cute, cute logo we did for her! Also, we were recently introduced to the ladies at Firefly Events! They do all sorts of events and are so talented! They wanted a creative marketing item they could give to vendors to make them memorable! We did cake mix in a mason jar with a tag and recipe that said, "Let Firefly Events make your next event a piece of cake"
HOW CUTE IS THAT?! And what a way to leave an impression! Please let us know if we can help you with business branding, logos, or marketing materials! We would love to! Sweepin the clouds away! Sesame Street is just a classic..and the kids LOVE it! But those furry characters don't always make the cutest invitations..we don't know about you all, but we do NOT like the cheesy character invitations sold in stores. Why not do something custom and make your child's party super swanky?!!! And then as favors we are doing sugar cookies by Sweet Cheeks cookies here in Nashville! Maggie has done some of the greatest shaped cookies for us! And they are DIVINE and not mention the cutest things ever!! Click here to see her Facebook page where you can contact her! Cookie Monster looks like he may have had one too many cocktails!HA! We think he is hilarious! And love Oscar the Grouch, too! So cute and fun...we made Sesame Street, chic!